Don't miss out on the halibut fishing on the Kenai Peninsula as it just might be some of the best fishing in Alaska. Halibut Fishing on the Kenai Peninsula! The number of worthy halibut fishing charters on the Kenai Peninsula in Alaska is growing faster than ever today. This opens up the choices between full service lodges with fishing charters to strictly guided halibut fishing trips for you to choose from. Halibut Fishing in Homer Alaska has been and still is the King of destinations with most resident and visiting anglers looking for some deep water action. This is where you find the big boys operating those larger boats capable of venturing out of the protected waters of Cook Inlet and into the open waters where those monster halibut are often found. The charter offices in Homer are primarily found along the boardwalks located at the end of the Homer Spit. Their boats are moored up in the marina just across the street. Convenience and comfort are two of the benefits from fishing out of Homer. 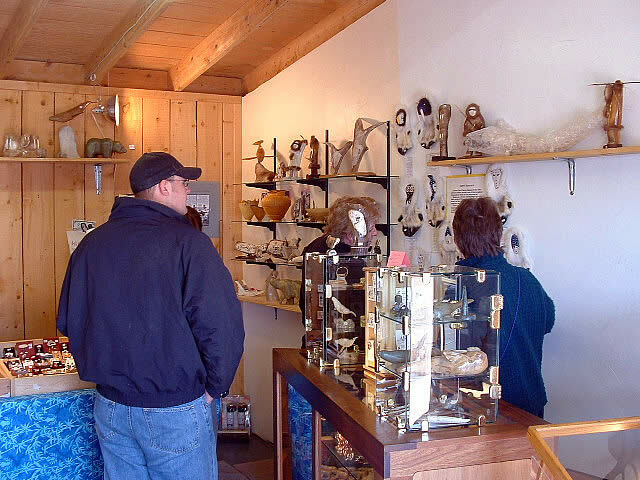 If you’re traveling with family that will be staying ashore there are lots of shops and some excellent dining options along the Homer Spit to keep them happy while you’re at sea. There is a trolley that connects the Homer Spit with the main portions of town. The trolley offers day passes for just $15.00 that allows you to get on and off as much as you desire. Museums and galleries, historical old town and the farmers market, and the Islands and Oceans Visitors Center will keep your party happy throughout the day. 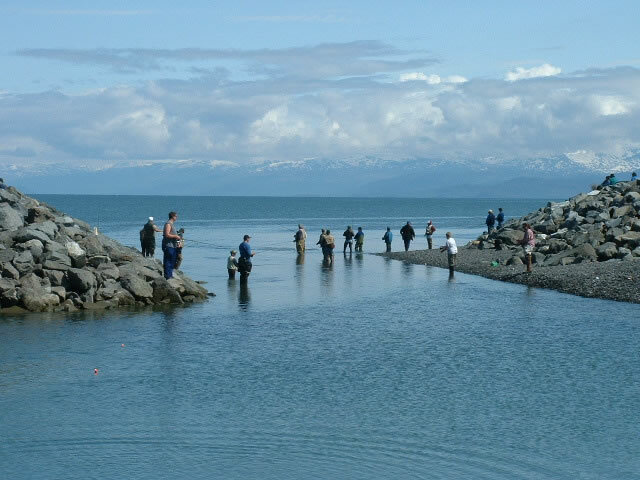 After a day of deep sea fishing you can try your luck with a little salmon fishing in the Homer Spit Lagoon. Each year the lagoon is stocked with salmon smolt that later return to the enjoyment of fishermen casting spinners and spoons from around this popular fishing hole. King and Silver salmon are the main targets but an occasional Dolly Varden is also caught. While Homer has always been known as the place to go for great halibut fishing, today there are some new rival locations just up the road that are commanding more attention than ever before. Ninilchik, Deep Creek and Anchor Point all are top destinations for halibut fishing on the Kenai Peninsula today. 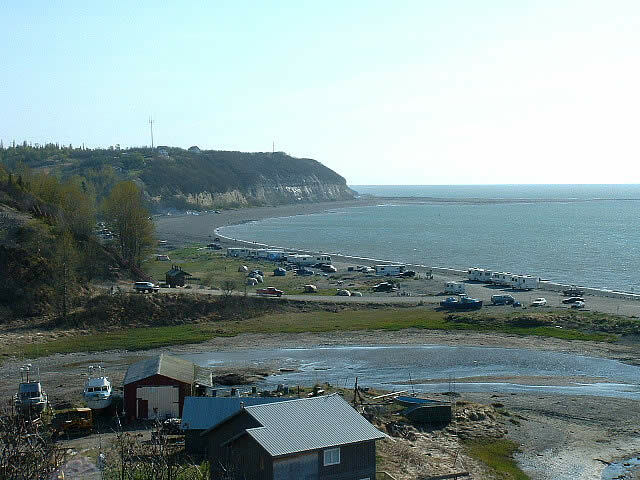 The town of Ninilchik blossoms into a fishing Mecca around June and the popularity of this area is growing fast. Commercial charters are launched via a tractor from the beach and jet across the inlet where the majority of the halibut fishing takes place. While the town of Ninilchik is one of the smaller towns on the Kenai Peninsula but still offers a world of fun and exciting activities along with the great fishing. 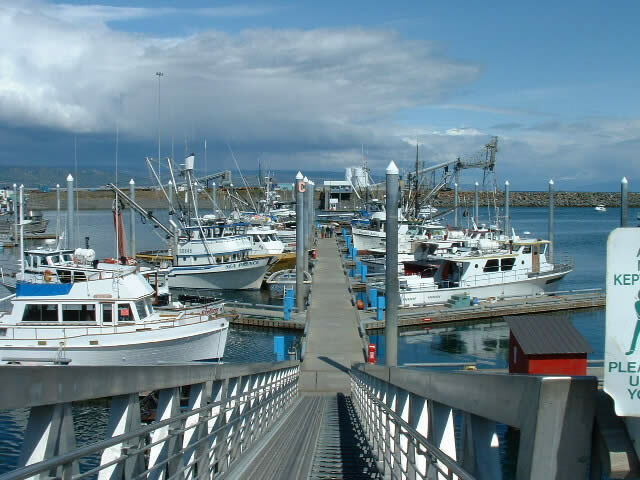 Read More @ "Ninilchik Halibut Charters"
Deep Creek is just a few miles down the Sterling Highway from Ninilchik and is basically regarded as being one in the same by most resident anglers. There are charters working out of both locations and the fishing experience is very similar to each other. You find Anchor Point about half way between Ninilchik and Homer along the Sterling Highway. Anchor Point offers some great camping opportunities along with outstanding fishing too. While we are talking mainly about halibut here, the salmon fishing in the Anchor River is very good too. Many of the charters offer combo trips where you can bring in some ocean fresh salmon along with a daily limit of Alaskan halibut. Read More @ "Anchor Point Halibut Fishing"